We got a pleasant surprise in a recent press release sent to us from Nintendo. Aside from all the other news such as Wii Music, a new Punch-Out! !, and Sin & Punishment 2 which are coming to the Wii there was also some fresh info about WiiWare for a change! The excellent Cave Story coming soon to WiiWare! We knew all about Tetris Party, Strong Bad Episode 3 and World of Goo, but we were surprised to hear confirmation that the rumour that the excellent Cave Story is coming to WiiWare is actually true! For those not in the know about Cave Story you might want to read up a bit about it on this excellent fansite. If games like Metroid, Castlevania and Megaman are your cup of tea then you will go crazy for this. The pixel art style is very impressive for a recent game, it’s easy to see how much care and attention to detail has gone into this game. It’s going to make a great addition to WiWare that’s for sure. In addition to this there is also an game called Boingz by NinjaBee studio which sounds like it might be quite interesting. It’s suddenly all looking pretty great for WiiWare. Tetris Party: This game will feature 18 game modes, including 10 never-before-seen single-player and multiplayer variations of Tetris. Some modes will use the unique capabilities of the Wii Remote and the Wii Balance Board. Strong Bad Episode 3: This third episode in the series features humorous story-driven game play, music-themed collectibles and achievements and an old-school side scrolling shoot 'em up mini-game, as well as a special celebrity guest appearance by rock gods Limozeen! World of Goo: This title is an award-winning, physics-based puzzle/construction game. Grab living, squirming, talking globs of goo to build structures, bridges, cannonballs, zeppelins and giant tongues. Cave Story: This title is an action-adventure game with new, exclusive content and features created only for the WiiWare version. Boingz: Developed by the award-winning studio NinjaBee and published by RealNetworks, Inc., Boingz introduces players to bendy, stretchy little critters who've found themselves scattered about an alien world. Using the Wii Remote, players can grab, stretch and fling the rubber-band bodies of the Boingz to bounce them around the environments and help them find their way home. 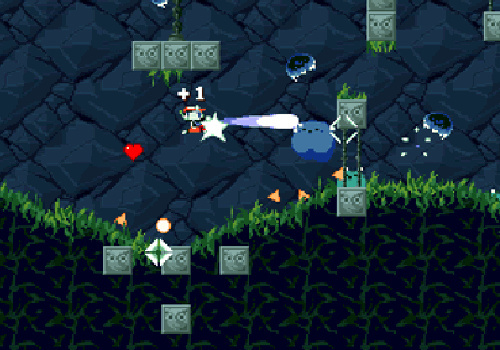 Cave Story will be another game on my "WiiWare games to get" list. Thanks Dazza, thats awesome it's coming to WiiWare! Awesome! Always good 2 hear about new games! And that conference was so awesome! Better than Ninty's last 2 showings at E3 combined! I just hope this doesn't mean the DS homebrew port will be cancelled, as I really want a handheld version of the game. Cave Story is the best free game of all time, and I will gladly pay whatever it costs for the new content. I hadn't heard of Cave Story before this, but now I am quite excited for its release! I am debating whetehr I shoud play the PC freeware version to hold me over or to just wait and be even more surpirsed with the WW release. Boingz sounds interesting, could be fun. I hate z's tacked on the end of words though. Like Petz Catz, ugh. I've heard of Cave Story before, and I've played some of Ninja Bee's games and they were pretty good, so I'll be looking foreward to both of these games. I spoke to Ron today about World of Goo as it happens. He is waiting for a final date and pricing from Nintendo, but he is pretty certain it is going to be "sometime" this month. I can't wait! THANK YOU! Cave Story sounds like what I've been pleading for, wiiware needs more platform, adventure games. Thanks for the MaBoShi info, I can't wait for the rest of the interview, the first part was great. Maybe I'll finally finish Cave Story... on the Wii then. It's been sitting on my Mac's HD for a long time now. Well into the game I got distracted by other things, such as real life, and I never was able to get back into it. With new content it'll definitely be worth the cash. It's good to see more quality titles... although "Let's Catch" should be re-titled "Let's Not!" It'll be ignored by me just like all the other shovelware. can't wait to see cave story how much will i cost? I never even heard of Cave Story before, but it looks incredible! And it's a platforming-type game, which Wiiware really needs more of. Boingz looks pretty cool too, despite the obnoxious replacement of "S" with "Z". First a storage solution, then M&L 3 and S&P 2, and now these games! I'm gonna go into a coma from all these great announcements! Cave Story!!?!?! No way! I remember that game, it's amazing! Everyone should go download it now, it's freeware! Now I have no plans on getting Tetris Party...getting Cave Story instead! @Dazza- I want WOG...I want it so much. I keep hearing October, let's go for sooner rather than later! Are you kiddin me?! A complete conversion of Cave Story for the Wii? I just started with it but I guess I'm gonna hold off playing through it on PC then cause this is too awesome to not support. And alos, extra content sounds great. I'm thinking it might very well be the first 10/10 here on this site. Sweetness! Oi! Can it be safe to say with all this good news from Nintendo, that the E3 disappointment can all be forgotten? I would pay 2000 wii points for that game to be honest. New Puch Out!! and Sin & Punishment? Wow!!! Cave story? I'll wait for more info and a review before jumping aboard the hype train. Boingz looks interesting... except for the z.
Online has been confirmed for months. YES! CAVE STORY! I kind of hope they don't make use of the Wiimote, unless they up the difficulty a bit. But seriously. When this game comes out, GET IT. Every single one of you! *Not excited at all about Tetris. One version of the game should be enough for anyone. Plus the hand-held versions make it a lot more pick-up-and-playable. Unless the different game modes add a lot to the old Tetris formula, I'll pass. *I hope Boingz looks A LOT better when it comes out. I probably won't get it, but if they're making a game they might as well give it some polish. The terrain looks so... ugh. P.S. @WindOnFire: Is it really "hype" if the game has already been released and played before? Normally, I just luk the boards getting info.....then Sin & Punishment 2 came along and I had to register, so......hi, nice to meet you guys, and BTW, i've never heard of Cave Story, is it worth getting? Welcome to Wiiware World, and if you want to know whether Cave Story is worth buying, just try it and see for yourself. oh my... i'm shaking. i practically fell out of my chair when i read that Cave Story is making it's way to WiiWare. but i do wonder if any new content will be made exclusive to the Wii? i think it should seeing as how you can get it free (as posted above). Everyone seems to love Cave Story; I'll have to check it out.